It seems our Tundra test truck was a ringer. According to Toyota’s website, the Inferno orange paint worn by our tester is only available when the $1110 Premium Package with TRD Off-Road package is selected, yet the window sticker mentioned only the separate $45 TRD Off-Road package, which supposedly limits your color choices to black, white, grey, or brown. 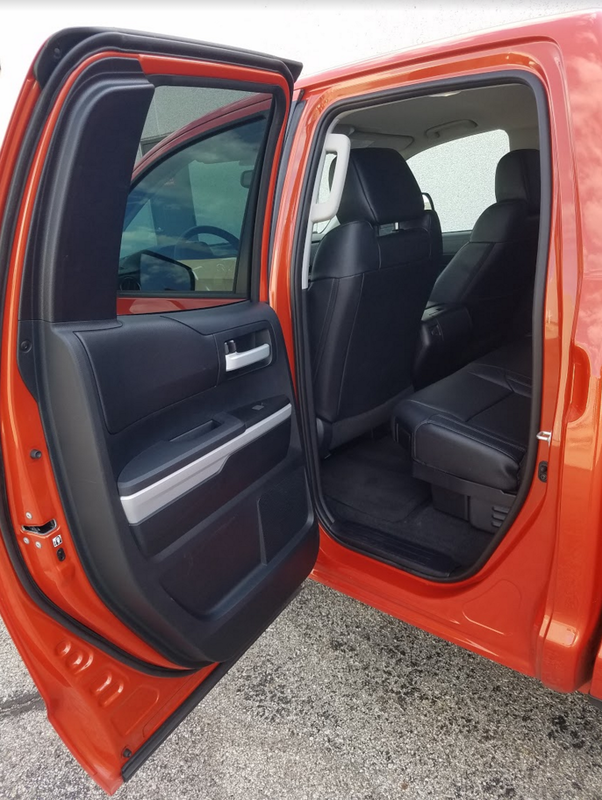 Toyota calls its Tundra extended-cab the “Double Cab,” and it benefits from having a conventional front-hinged rear door that’s far more convenient in close quarters than a rear-hinged one. Included in the TRD Off-Road package are engine and fuel-tank skid plates along with trail-tuned Bilstein shock absorbers and 18-inch wheels (replacing the Limited’s standard 20s) shod with All-Terrain tires. Whether the shocks and tires affected the ride significantly is uncertain, but what is certain is that our test truck suffered some rather jiggly and abrupt ride motions over the type of pock-marked pavement found around our Chicagoland office. So unless you’re planning to actually take your Tundra on off-road excursions — and by that I mean serious off-road excursions — you might want to just pocket the $45 and call it a day. 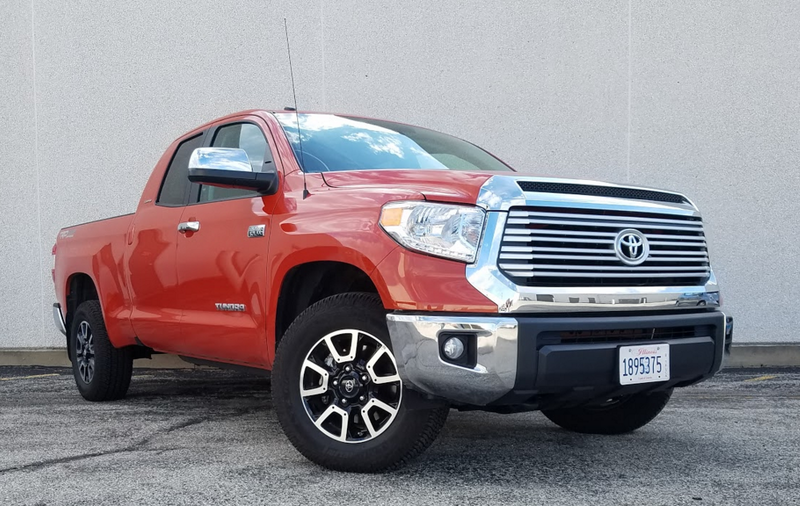 Tundras are offered in six trim levels (our Limited being about mid-rung on the ladder) in regular cab, Double Cab (extended cab), and CrewMax (crew cab) body styles with either rear-wheel drive or part-time 4WD. 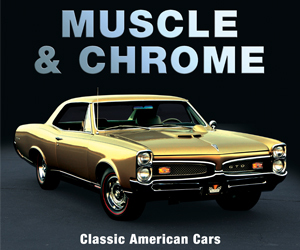 Most come with a 381-horsepower 5.7-liter V8 and 6-speed automatic transmission, though a 310-hp 4.6-liter V8 is also available on some models. Maximum payload and towing capacity is 2080 lbs and 10,500 lbs, respectively, on a 2-wheel-drive regular-cab, but our 4×4 Double Cab with the 5.7 is rated at 1580/9100. In any event, the engine provides strong acceleration with a good full-throttle jump off the line, and the transmission kicks down quickly for more passing power. Our average of 13.0 mpg in a fairly even split of city and highway driving is about par for the course for big V8 4×4 pickups, but about 6-mpg lower than we averaged with a similar Ford F-150 powered by a turbocharged EcoBoost V6. 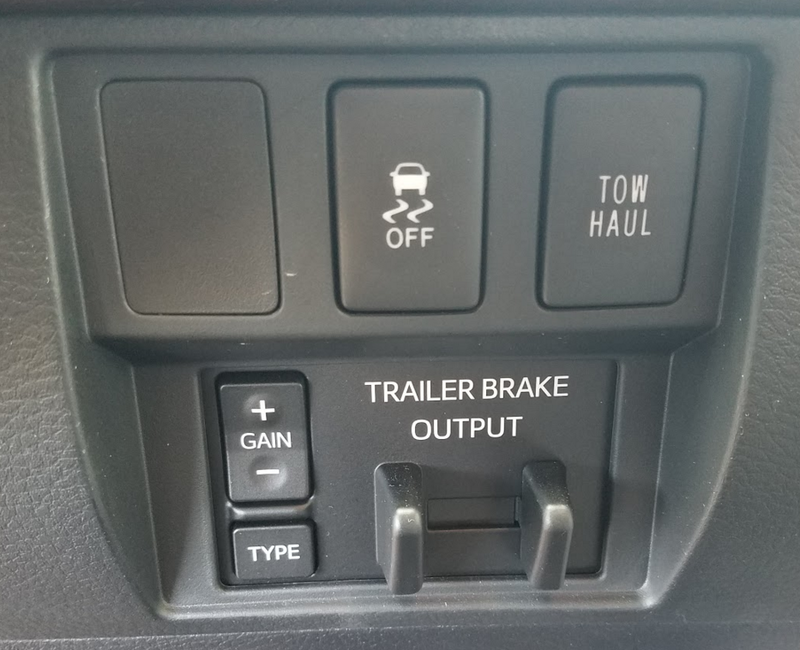 Our test truck came with a Two/Haul mode and adjustable trailer-brake control to augment its 9100-lb towing capacity. The Limited’s interior is nicely trimmed and offers great storage space. Inside, there’s plenty of headroom and legroom for front-seaters, but rear-seat passengers in Double Cab models such as our tester may find legroom gets tight if the seat ahead is pushed all the way rearward; in that situation, the knees of my 5’9 frame were scraping the front seat back. If that’s a concern, you can always jump to the CrewMax body style — which has ample room in back — though you’ll sacrifice a foot of bed length, as those come with a 5.5-foot bed in place of the Double Cab’s 6.5. Either way, 4×4 models have a rather tall step-in height, and our test truck had no running boards to ease entry and exit. However, note that the Double Cab has conventional front-hinged rear doors, which are far more convenient in tight spaces than the rear-hinged rear doors of some rival extended-cab models. The Limited is nicely trimmed, with thin padding on many surfaces (including the door tops) and some woodgrain and silver accents. Visibility is OK to the left front, but the angle of the roof pillar restricts it to the right front, and the thick side pillars block a lot over the shoulder. It’s fine to the rear corners, with a standard rearview camera helping while backing. 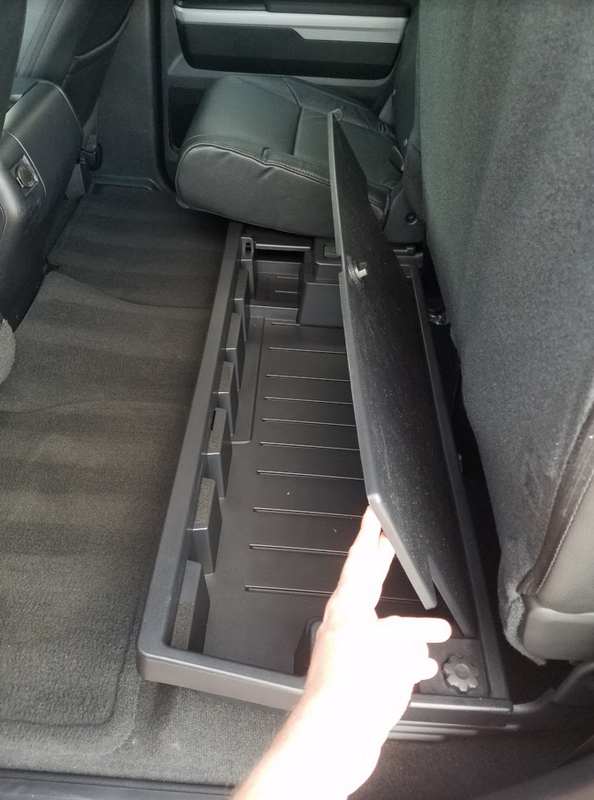 Flipping up the rear seat cushion reveals a huge hidden storage bin. Interior storage is terrific. There’s only a modest-size glovebox, but there’s a huge console box with 12-volt plug and a separate tray on top, three console cupholders (with one more in each of the large map pockets in the doors), a forward console tray under Aux, USB, and two more 12-volt jacks, a couple small console bins, and a handy dashtop tray. Furthermore, the rear seat cushion folds up to reveal large bins underneath. 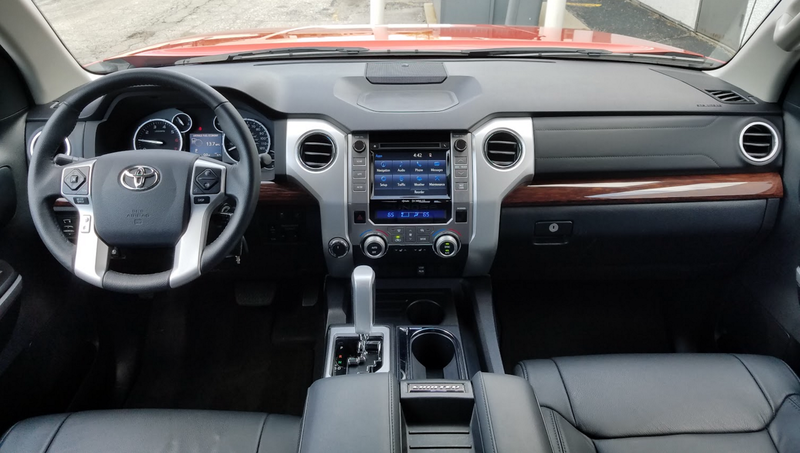 Tundra’s Entune infotainment system includes volume and tuning knobs (the latter a far reach to the right) along with some hard buttons, but most adjustments are made through the large touchscreen. Climate controls consist of a rotary temperature knob but less-convenient repetitive-step pushbuttons for mode and fan speed, but at least they’re within fairly easy reach. With many of its competitors getting recent redesigns, the Tundra — which was last updated for 2014 — is starting to show its age. 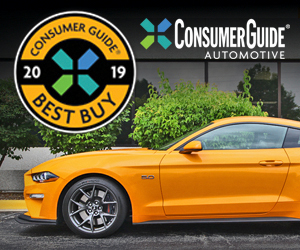 Some rivals get better fuel economy and offer a wider range of modern features, including more-convenient full-time 4WD and safety items such as forward-collision and lane-departure warning and mitigation. But Tundra covers all the basics and then some, and the aforementioned forward-hinged rear doors on our test Double Cab are a real benefit where extended-cab models are concerned. Toyota’s Tundra has never enjoyed the competitive success of the company’s cars and crossovers, but it remains a valid entry in the full-size pickup market. Written by: The Daily Drive staff on May 31, 2017.